President Obama and his Liberal, populist coterie did the their best to stir up anger and resentment against AIG, its executive, and the affluent in general due to those AIG executives being given retention bonuses that totaled over $165 million USD, which is approximately 0.0916% of the $180 billion that AIG received so far through the TARP bail-out. Yes, all the outrage, death threats, and political posturings are over slightly less than 1/10th of one (1) percent of the taxpayers’ money that AIG received through the TARP bail-out. The Democrats in the US House of Representatives passed a bill that would enact a retroactive confiscatory tax of 90% on the retention bonuses given to the AIG employees. To the Republican party’s shame they did this with the unneeded help of nearly half of the House Republicans. Democrats voted 243:3 in favor of the bill and Republicans voted 87:85 against it. So 85 Republican Representatives put re-election or personal outrage over the US Constitution and American values. Now President Obama is apparently trying to soften the impact of this rage and nascent class warfare. The Obama administration wants to soften the impact of bills speeding through Congress that would impose heavy new taxes on Wall Street bonuses. But some potential allies in the Senate are reluctant to cooperate, fearing the political consequences of watering down the legislation. Financial-industry officials launched a campaign Friday to fight back but are finding their hands tied: Anti-Wall Street sentiment following the American International Group Inc. bonus payouts is making it difficult to reach once-friendly lawmakers to make their case. Key senators and their staffers, nervous about appearing to support the industry, are refusing all meetings, and, in some cases, turning away phone calls. “Unless you have a pitchfork and a noose nobody’s listening to you” on Capitol Hill, said one financial lobbyist. The White House has yet to publicly criticize the bonus tax proposals. But administration officials say privately they are concerned the House and Senate bills could lead to an exodus of employees or whole companies from the Troubled Asset Relief Program, known as TARP, as well as other government-sponsored financial rescue efforts. It’s amazing. President Obama is acting like he is concerned that punitive taxes and legislation might cause American companies to refuse to cooperate with the federal government since that government would have, at that point, proven beyond any reasonable shadow of a doubt that it was no longer operating in anything approaching the best interests or ideals of America. Who’d have guessed that? NOTE: I truly hate that these AIG executives are getting bonuses after their gross stupidity and mismanagment. At a solely personal level I can sympathize with anyone who wants to butcher them en mass. I’m just not able to put my personal feelings above my concern for what punitive action against these people will do to Aamerica in the long run. Does it make anyone but myself find more than a bit disturbing and sickening that President Obama’s front-group, Organizing for America is not only having its membership swear Oaths Of Loyalty to Obama, but also swearing to spread the “good word” of Obama by going door-to-door, evangelizing President Obama’s manifesto? I wonder, will they, like the Mormons and the Jehovah Witnesses, bring literature with them? If so, what will it be, one of Obama’s – not one, but two – autobiographies,� Alinsky’s Rules for Radicals, Gore’s An Inconvenient Truth, or possibly Marx’s and Engels’, Communist Manifesto? I also wonder if this will be purely a grass-roots effort, or if ACORN, CAIR, MEChA, and other similar strong-arm groups will be involved, either openly or covertly. While I’m sure there are those will who vituperously disagree with with me, I find this Pledge Prject of Organizing for America (formally Obama for America) to be both disturbingly cult-like and counter to many of the core principles of American society. We do not worship our elected officials and we do not swear oaths of loyalty to them; we swear oaths of loyalty only to America. I do have one lingering question though; does this abominnation come from Obama or from those who have made him their Chosen One? Obama was a community organizer ala ACORN with all that it implies and was tutored in politics and manipulating the masses by the domestic terrorists Bill Ayers and Bernardine Dohrn, so it’s quite possible – but it’s far from a certainty from what I’ve seen and read. This vile and disturbing behavior could have arisen from his followers and not from Obama himself. I’ve often wondered if Obama created the phenomenom of his following, or if he just capitalized upon their blind faith and quasi-religious fervor. If the latter, I feel sorry for the President if they come to feel that he’s failed them. OK, it’s truly a moot point, but this cartoon bring up a very relevant point and possibility – if in a completely Liberal-biased – and/or amoral – and sarcastic fashion. 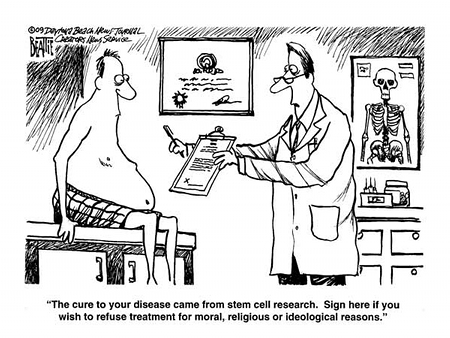 Leaving aside the Liberal’s propaganda of folding embryonic stem cell (ESC) research into the larger field of stem cell research, it’s a valid point that a moral person should question whether or not they’re willing to accept treatments derived from the destruction of human embryos. Perhaps it’s a fair and necessary compromise that all medical advances and procedures arising from the destruction of human embryos be labeled as such so that those people with moral objections to murder being used to further science can conscientiously object to such treatments. One wonders if the Liberals would be in favor of such a compromise because of a hope that the people with ethical and moral objections to killing human embryos would die off sooner, or if these Liberals would decry such a labeling as being stigmatizing and prejudicial and fear that free market pressures would scuttle the treatments – as they have repeatedly done during the last eight years. It has been said – most likely accurately – that President Obama’s 2012 campaign started on November 5, 2008. That being the case, I’m fairly positive that it’s never too early to start the propaganda campaign and media blitz / flood needed to facilitate the re-election of America’s 44th President. Obamaprompter does have certain advantages in the 2012 elections though. The camera adding 10lbs can only be a good thing, and he can – in extremis – fall back upon Milli Vanilli for inspiration and campaign songs, though Living Colour’s Cult Of Personality might be more apropos. Change you can wipe off with a squeegee.